Capacity reductions in the Philippines-United Arab Emirates (UAE) market are inevitable after 24 weekly non-stop flights between the two countries were added in 4Q2013. While there is considerable traffic between the Philippines and UAE, yields are generally low and there are large seasonal fluctuations. Three Philippine carriers entered the market at essentially the same time – Cebu Pacific, Philippine Airlines (PAL) and PAL Express – while Emirates launched services to Manila alternative airport Clark. Emirates already served Manila with three daily flights, having added the third frequency at the beginning of 2013. Etihad also serves Manila with two daily flights. Fares between Manila and Dubai or Abu Dhabi have dropped as the three Philippine carriers have struggled to fill new A330s. Load factors have been sustainable only during peak periods. Losses for all the carriers are likely if current capacity levels are maintained year-round. This is the first of a two-part series of analysis reports on Cebu Pacific’s new long-haul operation. This report analyses Cebu Pacific’s first long-haul route, Manila-Dubai, which launched on 7-Oct-2013, and the broader Philippines-UAE market. The second report, to be published later this week, will look at Cebu Pacific’s plans for additional long-haul routes in 2014 as it expands its A330-300 fleet from two to five aircraft. Cebu Pacific decided in early 2012 to expand into the long-haul low-cost sector, committing to an initial batch of leased 436-seat A330-300s. In Jan-2013 the carrier selected Dubai as its first long-haul route and began selling the new daily service nearly nine months ahead of launch with one-way promotional fares starting at PHP6,748 (USD166 based on the exchange rate at the time) including taxes and fees. Despite ample lead time, Cebu Pacific’s performance on the route for the first month was disappointing. In its results presentation for 3Q2013, Cebu Pacific disclosed that its average load factor on Manila-Dubai was about 36% during the first month of operation. It carried about 10,000 passengers to and from Dubai during this period. Cebu Pacific also disclosed in mid-Nov-2013 that forward bookings for the next three months were relatively weak, with only 20% of available seats sold. The route has been performing much better since late Nov-2013, with significantly higher load factors and some flights completely full. More details will be disclosed in Feb-2014, when Cebu Pacific reports its 4Q2013 results. But December and January are peak months for the Philippines-UAE market as Filipinos working overseas typically make their trips back home during the holiday season. February and March will be more challenging months while April will see another peak for Easter. On a year-round basis the Philippines-UAE is not an easy market to turn a profit on, particularly without any ability to sell flights beyond the UAE. The market is dominated by migrant worker traffic as the UAE has a population of about 700,000 expatriate Filipinos, making it the fourth largest overseas Filipino community (only the US, Saudi Arabia and Canada have larger Filipino expatriate communities). But Filipino migrant worker traffic to and from the UAE fluctuates significantly and during some months is extremely unbalanced with most passengers heading in one direction only. Emirates, Etihad and airlines serving the Philippines-UAE market with a one-stop product have an advantage over the Philippine carriers as they can respond to these fluctuations by focusing more on other markets to fill their Manila capacity during periods of weak Philippines-UAE demand. Cebu Pacific and the PAL Group are only able to offer connections beyond Manila, primarily only in the Philippine domestic market, providing limited options to fill their Manila-UAE flights during periods of low demand. Cebu Pacific also has been impacted by the 6-Nov-2013 launch of services to Dubai by PAL Express and by the 1-Oct-2013 launch of services to Abu Dhabi by PAL mainline. The PAL service contributed to Cebu Pacific’s lacklustre October performance as both carriers were new to the Philippines-UAE market and offered very low promotional fares in an attempt to stimulate demand. But this attempt was unsuccessful as October is an off-peak month. PAL, PAL Express and Cebu Pacific added a combined 6,900 weekly one-way seats in the Philippines-UAE market. Meanwhile Emirates’ capacity increased from about 7,800 to 10,400 weekly one-way seats after it launched service to Clark. Factor in Etihad’s approximately 5,300 weekly seats, which has remained stable, and total capacity shot up by over 70% practically overnight from about 13,100 to about 22,500 weekly one-way seats. 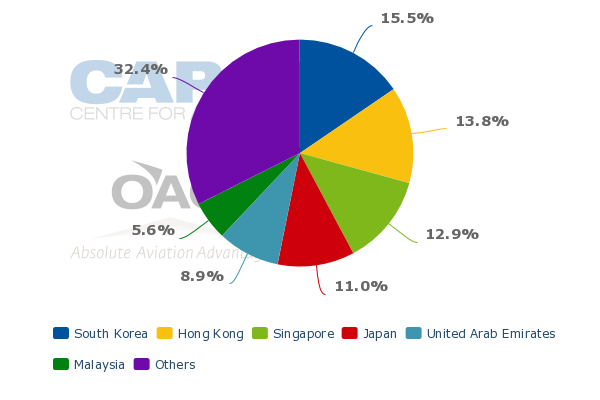 The increase in capacity allocated to the local market was even more pronounced as most of the additional capacity is being provided by Philippine carriers that do not offer any connections beyond Dubai. Previously the market was under-served with Cebu Pacific claiming that 70% of passengers travelling between Manila and Dubai were opting for one-stop flights (as Emirates was mainly carrying passengers beyond Dubai and being undercut in the local market by carriers such as Cathay Pacific). But with Cebu Pacific, PAL and PAL Express all entering at once, the market has quickly swung from under-served to over-served, putting pressure on all players (including the one-stop carriers) to reduce prices. As PAL Express did not launch its Dubai service until just before the start of the peak season, the full impact of all the additional capacity will not be felt until the next off-peak period, which typically starts in late January. 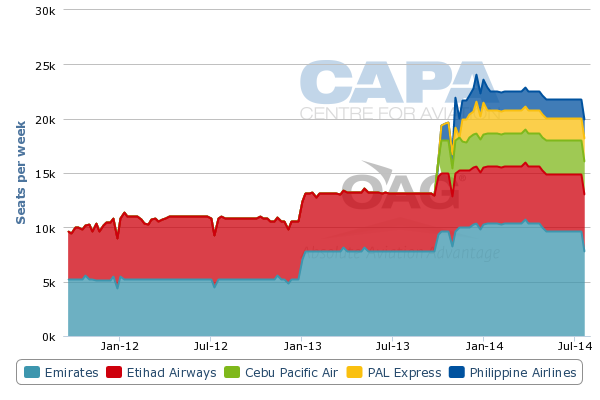 Cebu Pacific’s online booking engine reveals it has cut back services to Dubai to five weekly flights for the remainder of Jan-2014 and all of Feb-2014. This would be an indication of soft demand and a potential return of the unfavourable conditions that were experienced in Oct-2013 – although this time potentially even worse as PAL Express is also now competing in the Manila-Dubai market. For now Cebu Pacific is selling six weekly flights for most of Mar-2014 and a full daily service for the rest of the year. But the carrier will likely need to look at implementing further cuts at the conclusion of the Easter season. Even with the slight reduction in capacity from Cebu Pacific, fares for Feb-2014 remain extremely low. Cebu Pacific is currently offering a one-way fare of PHP7,549 (USD167 based on the current exchange rate) including taxes and fees for travel in the second half of Feb-2014. PAL’s website is currently offering one-way all-inclusive fares for Feb-2014 starting at USD311 to Abu Dhabi and USD341 to Dubai. PAL and PAL Express both offer complimentary meals, drinks and checked baggage while Cebu Pacific charges for these items. PAL also offers in-flight entertainment (IFE) across all classes, a business class cabin, premium economy and roomier economy seats. PAL Express does not have any IFE and squeezes 414 seats in its A330-300s, making it only slightly less dense than Cebu’s 436 seat configuration. Cebu Pacific has the world’s densest A330-300 configuration, packing in only four fewer seats than the aircraft’s certified limit. PAL Express and Cebu Pacific both have nine-seat abreast 3-3-3 layouts while PAL uses the more typical eight-seat abreast 2-4-2 layout in economy. Emirates is now selling on its website return all-inclusive fares starting at USD960 for Manila-Dubai and starting at USD911 for Clark-Dubai. Etihad’s online fares for Manila-Abu Dhabi are higher, starting at USD1296 for a return ticket. (One-way fares online on Emirates and Etihad are significantly more expensive). Cathay Pacific is also extremely competitive, offering on its website Manila-Hong Kong-Dubai return fares that start at only USD605 including taxes. Cathay is the largest one-stop carrier in the Philippines-UAE market and has traditionally moved a large volume of migrant workers between Manila and Dubai as well as Abu Dhabi. Manila-Hong Kong-Abu Dhabi is currently priced at USD920. The launch of non-stop services to the UAE by Philippine carriers has impacted Cathay, pushing down the carrier’s already low economy yields on the route. Singapore Airlines also offers a one-stop product between Manila and Dubai but has not generally been a high volume mover in this market. Singapore’s online return fares for Manila-Singapore-Dubai currently start at USD992 including taxes. Singapore Airlines no longer serves Abu Dhabi. While it appears Cebu Pacific is now undercutting PAL/PAL Express and Cathay Pacific by about 50% (and Emirates and Etihad by even bigger margins) this is not an accurate indication of the cheapest fares available in these markets. The full-service carriers serving the Philippines do not rely much on online distribution channels and often provide big discounts to agents, particularly for high volume migrant worker contracts. In fact some one-stop carriers in the market, such as Royal Brunei Airlines, only sells tickets between Manila and Dubai through agents. Cebu Pacific’s initial weak performance to Dubai could be an indication it is still learning about the rather complex world of migrant worker contractor/agent purchasing patterns. While Cebu Pacific has been serving several short-haul international destinations that have large Filipino worker populations, such as Hong Kong and Singapore, these markets are different in that many of these workers purchase their tickets independently. For long-haul destinations that see significant Filipino migrant worker traffic almost all the purchasing is done through their contractors. Cebu Pacific got a jump on its competitors by starting to sell Dubai tickets nine months ahead of launch compared to six months for PAL and only about two months for PAL Express. But it turned out that the earlier start of ticket sales was not an advantage as almost all tickets in the Philippines-UAE market are purchased with short notice by labour contractors. The number of Filipinos who buy their own tickets is very small, even with Cebu Pacific trying to stimulate demand by offering very low advance purchase fares. Cebu Pacific’s inability to initially stimulate new demand in the market is not an encouraging sign. The carrier should be able to improve its load factor on Manila-Dubai as it becomes more experienced at selling to the contractors and agents that control most of the Philippines-UAE market. But this market is generally a zero sum game, meaning any additional passenger Cebu Pacific gets is likely coming at the expense of another carrier (and at a very low yield). Capacity rationalisation is likely. The PAL Group initially planned to serve Abu Dhabi and Dubai daily but likely adjusted capacity plans, removing two weekly frequencies, in response to weak forward loads. Cebu Pacific may also have to settle for a less than daily service on a permanent basis and drop consideration of also serving Abu Dhabi. The PAL Express product is a better fit for this particular market. The carrier’s higher density A330s and lower unit costs allows it to compete better with Cebu Pacific. Business class demand is limited and competition with Emirates and Etihad for premium traffic is fierce. Emirates has the advantage of adjusting seat buckets and fares in the local Manila-Dubai market depending on the time of year as it can backfill with passengers heading to other parts of the Middle East, Africa, Europe and the Americas. But with four daily flights now in the Manila market Emirates will at least be somewhat impacted by the new capacity that has been added by the Philippine carriers. In selecting Dubai, Cebu Pacific stated that 70% of passengers flying between Manila and Dubai were using one-stop carriers rather than Emirates. But this data was based on origin and destination figures from 2012 – before Emirates added its third daily flight to Manila in Jan-2013. While a majority of its Philippine passengers transit in Dubai, as Emirates has added more and capacity in the market inevitably it is able to offer a larger number of seats to agents or migrant worker contractors at competitive fares. Emirates further expanded capacity in the Manila market at the end of Oct-2013, when it launched a daily service to Clark, giving it twice as much capacity in the Philippines compared to late 2012. Manila and Clark are Emirates’ only destinations in the Philippines while Etihad only serves Manila. Cebu Pacific, PAL and PAL Express have the advantage of offering domestic connections but this is limited as almost all Filipinos heading to the UAE fly from Manila as Manila is where the labour contractors are based and where their visas are processed. Cebu Pacific previously estimated that only 10% of its Dubai passengers would not originate in Manila. Etihad has not increased capacity to Manila since Nov-2011, when it introduced its second daily flight. The carrier has likely looked at adding a third daily flight – which it could only implement by following Emirates to Clark as there are no available slots and traffic rights at Manila. The Manila market is an extremely important market for Etihad. The Abu Dhabi-based carrier recently stated that Manila was its second busiest market after Bangkok in 2013, with 547,000 passengers. Even London was smaller. Assuming Etihad operated all its Manila flights in 2013 with its two-class 412-seat 777-300ERs, which is the densest aircraft in its fleet, the carrier had an average load factor to and from Manila of 91%. With such high load factors Etihad should not be significantly impacted by the additional capacity from the Philippine carriers as there should be sufficient demand in connecting markets to further reduce its already low reliance on local passengers. While adding more capacity to Manila is tempting, Etihad would be smart to give Clark a miss and continue only with its two daily Manila flights. The UAE is now the fifth largest international market for the Philippines, accounting for 9% of total international seat capacity. More capacity is the last thing the market can use. With just two daily flights, Etihad will be able to focus more on connecting passengers beyond Abu Dhabi. Competition in the Philippines-Europe market is also increasing with PAL launching non-stop services to London in Nov-2013 and planning multiple new destinations in continental Europe for 2014. But PAL will not be able to come close to matching the network of Etihad (and Etihad alliance partners) or Emirates. For several years PAL did not serve the UAE, recognising the challenges of competing against Emirates and Etihad and their ability to offer Philippine passengers unmatched networks beyond their hubs. PAL instead chose to codeshare with both carriers. The resumption of services to the UAE is part of an ambitious expansion plan under new PAL owner San Miguel. Unfortunately for Cebu Pacific, the expansion at the PAL Group comes just as the LCC moves into the long-haul sector with UAE the logical first market for the new widebody low-cost operation. The Philippines-UAE market does have opportunities for Philippine carriers. But the yields are low and the market has huge seasonal fluctuations. There is risk of large losses as Philippine carriers start to realise it is not a market where new demand can be easily stimulated. Philippine carriers will need to rely on wooing passengers – or labour contractors – away from very competitively priced one-stop products. But there are not enough of these passengers to go around outside the peak periods. At current capacity levels there will be no winners.